Wedding Dance is my speciality! Your first dance is a special moment of joy and celebration that will be a lifetime memory. It's a time when you will be centre stage and many eyes will be on you. My goal is to help you appear elegant and comfortable while dancing in front of your wedding guests. Don't worry if you have not danced before, I will teach you to dance with patience and ease. Your first lesson we will discuss your wedding reception venue, the size of the dance floor/layout and the position of the audience. I will listen to your chosen song and we will discuss which dance best suits your music. Your wedding dance routine will begin with the groom taking his new bride onto the dance floor then do a dip or turn and begin your dance. 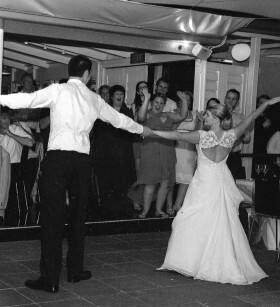 You only need to do a couple of minutes dancing your wedding dance then it is time to invite your guests to dance! I will choreograph your routine with easy lifts, spins, oversways, dips and incorporate simple basic steps to get you moving around the dance floor. 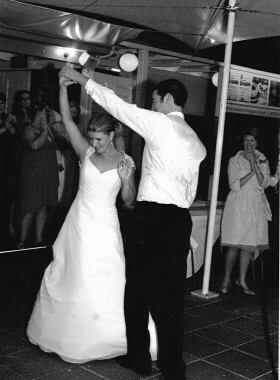 On your last lesson we have final rehearsal and learn to dance to all types of music so that throughout your wedding reception you will be able to continue dancing the night away! I endeavour to make the lessons a fun and enjoyable experience.